Bitcoin this…crypto that…blockchain the other. It seems like I can’t get through any conversation, let alone a day, without someone bringing up bitcoin or its crypto cousins. The mania continues, so it’s time for an update. I’ve written about cryptocurrencies three times this year. You’d think that was more than enough. But, just like any other form of gambling, you have to keep a close eye on what’s going on, or you might just miss the action. When I say “gambling” I choose my words carefully and deliberately. Crypto world is not one of investments, where sober judgements are made after logical reasoning based on the weight of evidence. Instead, it’s a world of rampant speculation. No one has a clue what happens next. And those that claim they do are not to be trusted. If you own any cryptos, or think you’d like to, make sure this is how you view it. Risk only what you can afford to lose. Don’t feel obliged to risk even that much. That said – and as I’ve argued before – I believe cryptocurrencies like bitcoin, and the blockchain technology they rely on, are probably here to stay. In the same way as, say, web search was here to stay in 1999. It’s just that no one knew back then who would end up dominating it. Google is so ubiquitous these days that it’s easy to forget that it was just one of many alternatives back in the late 1990s. In fact, it was only founded in September 1998, which was more than four years after Yahoo (or Webcrawler, or Lycos, or AltaVista). Knowing which of today’s cryptocurrencies have genuine staying power is similarly tricky. In May there were 831 cryptos. 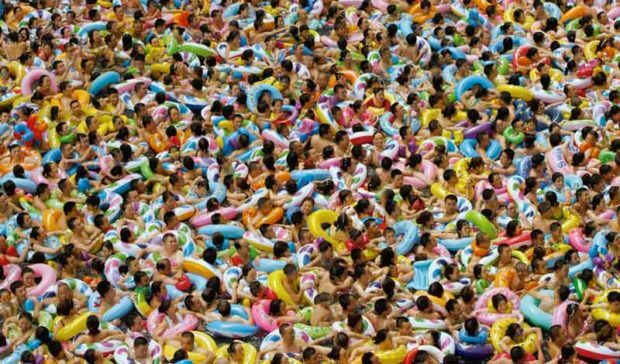 In August there were 1,097. Now there are 1,275. As I’ve previously pointed out, there are still only 177 fiat currencies in the world. Crypto advocates often lament the unlimited units of each fiat currency that can be created. They tend to conveniently forget the unlimited number of entire cryptocurrencies that can be created, even if the units of each can be limited (but don’t necessarily have to be). At the same time as the number of cryptos has grown, the market capitalisation of the whole crypto world has kept on growing too. In general, prices have risen, but not in all cases. When I wrote in May, all cryptos were worth US$80.3 billion. 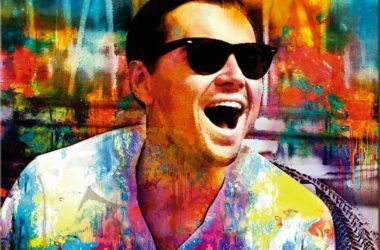 By the end of August that had rocketed to US$171.1 billion. Now it’s jumped even higher, to US$209.2 billion (using data from coinmarketcap.com). That said, the whole area continues to be dominated by a handful of big cryptos, with bitcoin still firmly in the lead. Here’s an update of how that market capitalisation is split between the top 10 and the other 1,265 “also rans” (or, perhaps, “about to runs”). As a reminder, there used to be only one bitcoin. Then there was a so-called “fork” and it was split between bitcoin and “bitcoin cash”. 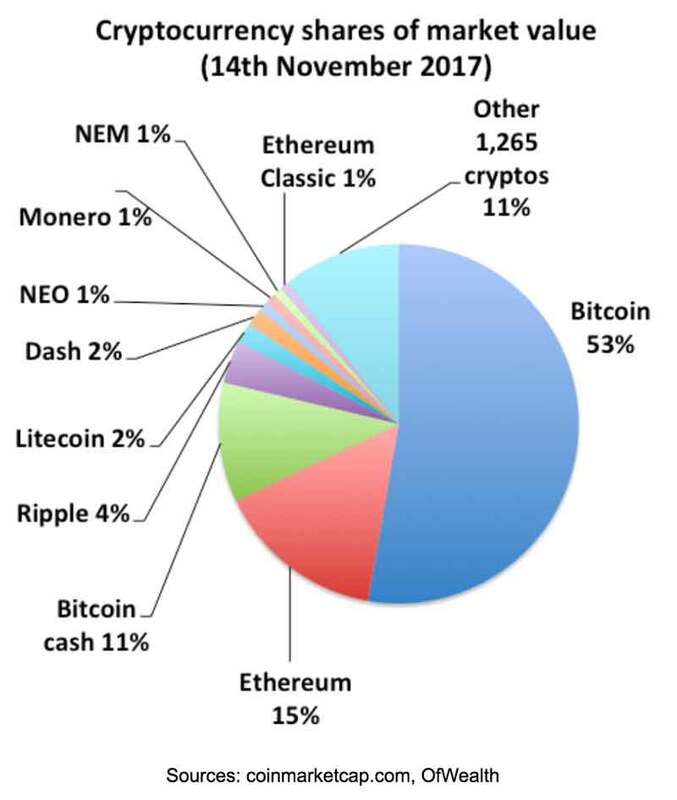 Between the two they still make up 64% of the total crypto market capitalisation. This is down from 80% back in March, as loads of new cryptos have been created. But it’s actually up from 46% when I looked in May and 51% in August. You can see on this next chart how the two bitcoins are taking back market share, after the earlier frenzy for the likes of ethereum and ripple has started to die down. Note how the blocks for all non-bitcoin categories are actually smaller now than in August (in the case of ripple it’s also smaller than it was in May). A couple of interpretations of that trend spring to mind. One possibility is that bitcoin and its bitcoin cash cousin are consolidating their positions as the leaders and eventual winners. Another is that this bubble is long in the tooth, and it’s already starting to show up in the falling value of the huge tail of marginal cryptos. 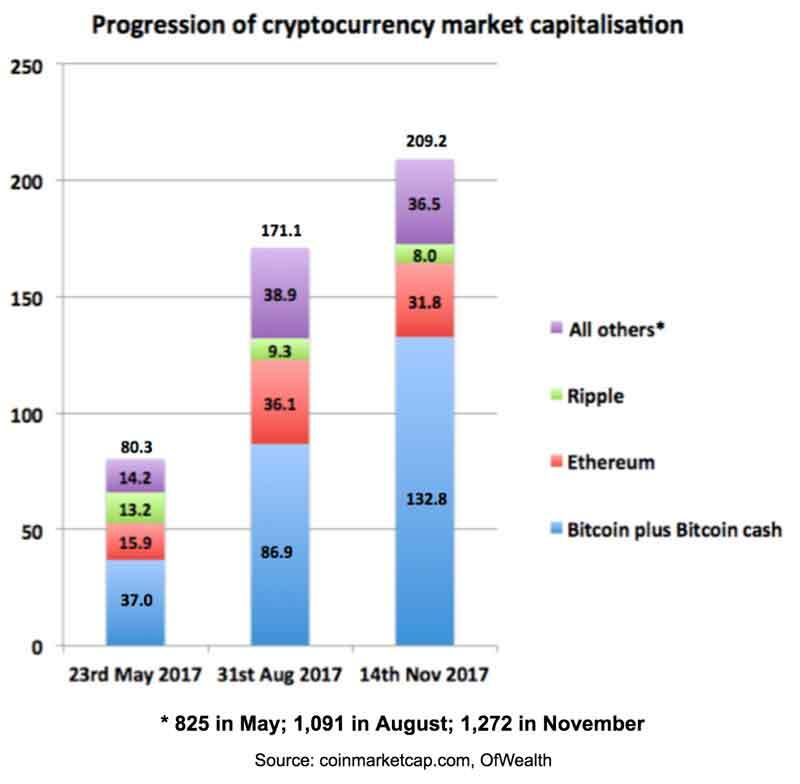 For example, if you exclude the top four – being (consistently) bitcoin, ethereum, bitcoin cash (post-August) and ripple – then the average market capitalisation of the rest has started to fall. It was US$17.2 million when I wrote in May, rose to US$35.6 million at the end of August, and has now dropped to US$28.6 million. That could signal a following wind that’s starting to run out of puff. Still, that leave the two bitcoins out in front, and apparently showing little signs of slowing down. But the price volatility is insane. In just the past week, bitcoin has traded in a range of US$5,507 to US$7,879. It fell 30% in four days, then rose 18% in two days. 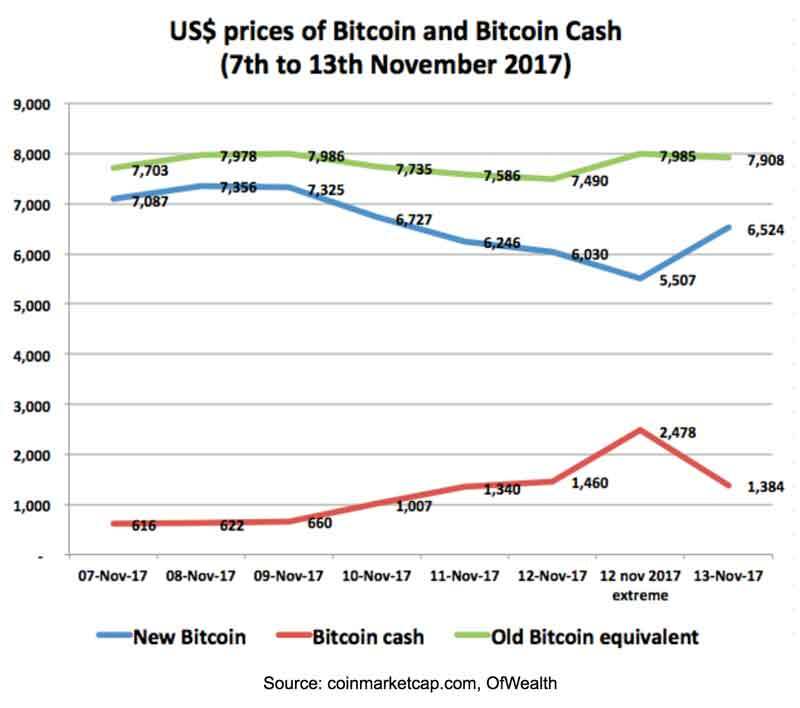 On the other hand, bitcoin cash closed 7th November at US$616.14, but briefly spiked to US$2,477.65 on 12th November. That’s an insane gain of 302% in five days. Although it then fell back to US$1,384.12 by the end of 13th November, losing 44% in a single day. Are there still people out there who say this market isn’t speculative? One thing I did spot is that bitcoin and bitcoin cash were headed in separate directions over that period. If you owned both then you got a much smoother ride. It seems like they would dump one to grab the other, and then went into reverse. I realise there are theories and explanations for why these huge price moves happened. But, to be honest, they’re irrelevant. If you’re in this space there’s only one thing you need to know: violent price swings, in either direction, could happen at any time. How long will this current circus keep going? Again, no one knows. Provided more and more people are willing to enter the casino and swap loads of fiat currency for a punt on a crypto or two, prices will rise. But if (when) the money inflows slow down – even if only temporarily – it could be death spiral time. At least until the next episode, most likely with a few intervening years of much lower prices. Most of the marginal stuff will be obliterated, if it hasn’t been already. Recently I came across the following chart in the context of another technology, machine learning. 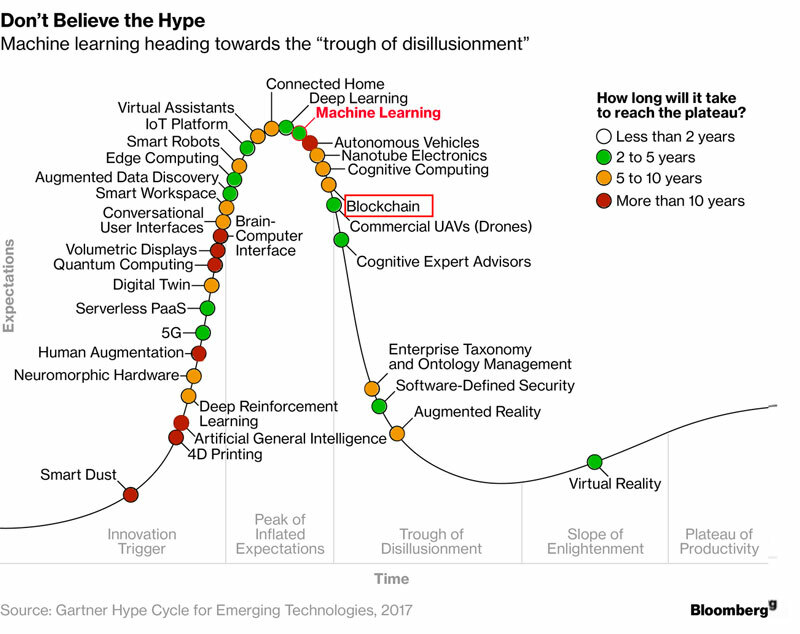 It’s something called the “Gartner Hype Cycle for Emerging Technologies”. You can see blockchain in there, just heading down the right hand side of the steep slope. I have no idea if this chart is right. But, looking at the key, it suggests that we’re still five to ten years from blockchain and the cryptos being genuinely useful, and hence going properly mainstream (reaching the “plateau of productivity”). In the meantime, we’ve still got to scramble down the “peak of inflated expectations”, drink from the “trough of disillusionment” and begin to ascend the “slope of enlightenment”. That feels about right to me. Beware everything in between.